Under the new Apprenticeship Reforms, new Trailblazer Apprenticeship Standards are being developed with plans for 600-800 Apprenticeships becoming available in the future. The new Apprenticeships will more readily meet the needs of employers and those completing an Apprenticeship; they will be more flexible, more effective and give the employer more control. In-programme training and learning will develop the Apprentice’s knowledge, skills and behaviours which are set out in the Apprenticeship Standard. The Apprenticeship programme is for a minimum of one year. The programme will have milestones to mark progression and may be assessed according to the Apprenticeship Standard. There are no mandatory requirements for qualifications. Apprenticeships will require learners to develop Maths and English skills. 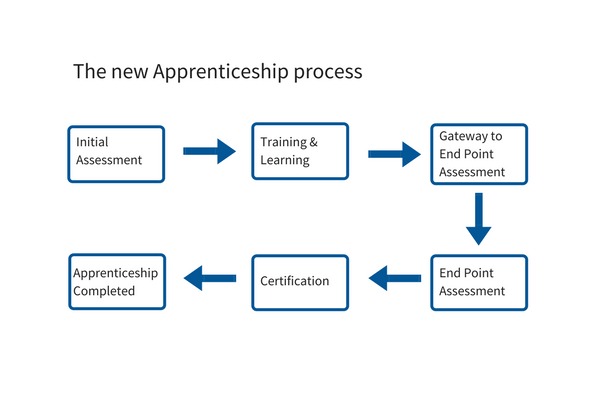 The gateway refers to the point towards the end of the Apprenticeship programme where the employer and training provider ‘sign off’ the Apprentice as being ready for End Point Assessment and having achieved the level of knowledge, skills and behaviours for the Apprenticeship. The approach to the gateway is specified in the Apprenticeship Standard but may include achievement of a qualification, an interview or presentation of a portfolio. Until now, Apprenticeships have used continuous assessment leading to a qualification. This is no longer the case with the Trailblazer Apprenticeships and is a major change to the new arrangement. The organisation and assessor carrying out the End Point Assessment will have to be independent of the training provider and the Apprentice’s employer. The requirements of the End Point Assessment are set out in the Apprenticeship Assessment Plan. The apprentice is given a grade once the End Point Assessment is completed. Certification of Apprentices will continue to be awarded by the Federation for Industry Skills and Standards (FISSS). The organisation undertaking the End Point Assessment will apply to FISSS at the appropriate point for the Apprentice certification. End Point Assessment is the main method of assessment for the new Trailblazer Apprenticeships. It allows much more of a focus on the learning experience for the Apprentice before they go on to be assessed. Once an Apprentice reaches the end of their programme, they will be ‘signed off’ as ready for End Point Assessment by their employer (Gateway). The End-Point Assessment will then confirm if the Apprentice has the required knowledge, skills and behaviours required of the standard set out for the Apprenticeship they have undertaken. The assessment is taken independently of the training provider and the employer and the Assessor will not have had any part in the Apprentice’s training. The methods used in the End Point Assessment will depend on the occupation that the Apprenticeship sits within. It might include, for example, an interview, an assessed presentation with questions and answers or a test of some kind. How Much Will End Point Assessment Cost? The cost will depend on which Apprenticeship your employee has completed. We will confirm the assessment with you and then cost it according to what is required by the appropriate Apprenticeship standard. Sometimes the Apprenticeship Standard provides guidance on cost. There is part-funding available for end-point assessment. How will we work with Employers and Training Providers for End Point Assessment? Once you have selected cHRysos HR as the End-Point Assessment Organisation for your Apprenticeship, we ask you to notify us as early as possible. We recommend that you make your selection at the beginning of the Apprenticeship programme and certainly in good time so that we can provide support for the Apprentice to prepare for End Point Assessment. We will provide sample assessments and diagnostics for you and your training provider to use throughout the training and learning activity so that your Apprentice is prepared for End Point Assessment and knows what will happen. We will however remain independent of yourself and your training provider in the Apprenticeship delivery, including the training being delivered. Once the ‘gateway’ has taken place, the End Point Assessment process begins. You will need to ensure that the Apprentice has completed any requirements set out in the Apprenticeship Standard before the ‘gateway’ process takes place. This includes demonstrating the appropriate level of maths and English and the completion of any activities specified in the Assessment Plan, for example, the work-based project. We will allocate an End Point Assessor to your learner. The Assessor’s role will be to manage the assessment process and make arrangements with yourself, your training provider and the Apprentice for the assessment to take place. The Apprenticeship Assessment Plan will determine what assessments are required, if they need to be done in a specific order and in a set timescale. If your learner is not successful in passing the End Point Assessment, the Assessor will give feedback to the Apprentice, yourself and your training provider on the outcome and any additional training that is needed before the Apprentice can re-sit. Once successful in completing the End Point Assessment, we will apply to FISS for certification of your Apprentice. If you would like more information on our End Point Assessment service, or have any questions about the Team Leader/Supervisor Apprenticeship or Operations/Departmental Manager Apprenticeship that cHRysos HR are approved to undertake End Point Assessment for, please contact us by email: info@chrysos.org.uk or Tel: +44 (0)1302 802128.